This visitor centre in Tokyo by Japanese architects Kengo Kuma and Associates looks like a stack of smaller buildings with sloping roofs. Named the Asakusa Culture Tourist Information Center, the building is located near the outer gate to ancient Buddhist temple Sensō-ji, which was constructed in the sixth century and is the oldest of its kind in the city. Horizontal slices divide the tower's eight main storeys, creating sloping ceilings in conference rooms and an exhibition space, as well as a tiered floor inside the multi-purpose hall. Wooden louvres shade each of the four glass elevations and are spaced differently depending on the shade and privacy required by the rooms inside. 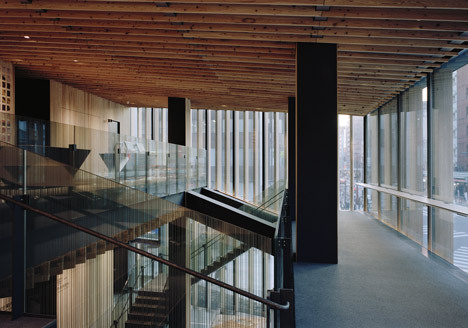 Surfaces inside the building are also timber-clad and balconies are located on two of the upper floors. 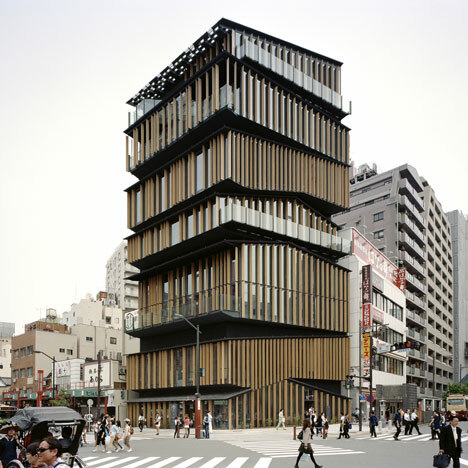 Kengo Kuma & Associates also recently completed a pharmacy and clinic with plants sprouting through its facade - see it here. Photography is by Takeshi Yamagishi. In the corner premise of just 326sqm across Kaminari-mon Gate, the building was required to accommodate plural programs such as tourist information center, conference room, multi-purpose hall and an exhibition space. The center extends Asakusa’s lively neighborhood vertically and piles up roofs that wrap different activities underneath, creating a “new section” which had not existed in conventional layered architecture. Equipments are stored in the diagonally shaped spaces born between the roof and the floor, and by this treatment we could secure large air volume despite its just average height for high-and medium-rise buildings. Furthermore, the roofs not only divide the structure into 8 one-storied houses but also determine the role of each floor. First and second floor has an atrium and in-door stairs, creating a sequence from which you can feel the slope of the two roofs. On 6th floor, taking advantage of the slanted roof, we were able to set up a terraced floor with which the entire room can function as a theater. As angles of the roofs inclined toward Kaminari-mon and the heights from the ground vary from floor to floor, each floor relates differently to the outside, giving a unique character to each space. Electrical engineering: Kankyo Engineering inc. Mechanical engineering: Kankyo Engineering inc.